Step 1 Select “Supplier” from pull down and the system will automatically retrieve some common data (Contact, Fax No, Tel No and Address). 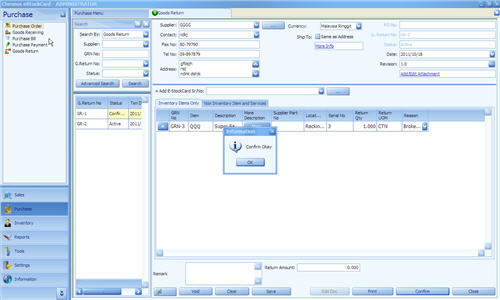 Step 2 Click “+Add e-StockCard Serial No” pull down (this is the unique serial number that is being generated by eStockCard for each of the Items during storing at Goods Receiving screen). Step 3 Enter the “Reason” for the return if it is applicable. 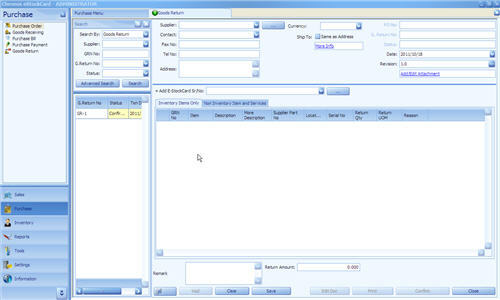 Step 4 Click “Save” and new Goods Return number to be generated and the status will set to “Active”. The user can continue to amend as long as the status still in “Active”. Please also note that once return, the items will be auto-deducted from their current locations and the quantity will be updated into the stock inventory reports.